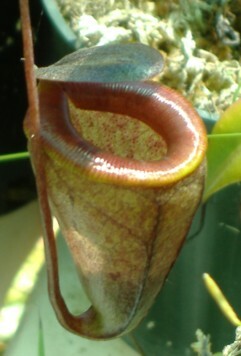 Nepenthes tenuis is a small pitchering vining species. The first time I ever saw this species available was from The Nepenthes Nursery in Germany. They offered a few cuttings and were quickly snatched up. Then a few other cuttings started surfacing here and there. Photos started appearing in some of the forums and this species seemed to be circulating primarily in Europe. I was emailed from another grower in Italy saying he had obtained a cutting from a grower in Germany. As luck would have it, I was able to get one from that grower. The cutting was lost in the mail for over a month and a half and I thought I'd never see the plant. Then one day a box arrived. I couldn't believe it was the plant from so long ago. The cutting was still green except for the growing tip that had turned black! I thought that the plant would eventually die but it didn't! I put it outdoors and it has been growing ever since. It grows very similar to N. tobaica and stays relatively small. It has put out several sideshoots and is growing well. Considering what this plant has been through, it seems to be real hardy. Now that it is fully rooted I treat it just like my other highlanders and rarely give it a second thought. 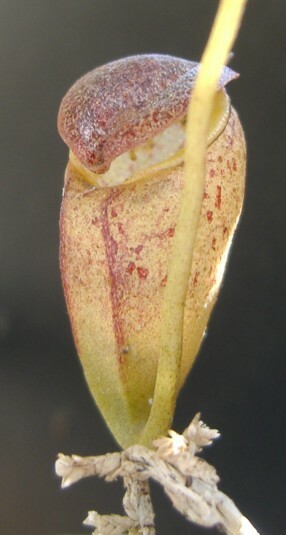 There's a species profile in the book Nepenthes of Sumatra and Peninsular Malaysia showing a photo of the plant. The profile pretty much lists this species as lost from the original photograph taken. I don't know where the cuttings originated from so the species must have been rediscovered. Currently the only available specimens seem to be from cuttings. How many different clones are out there is a mystery to me. I also haven't heard anything if small seed grown or tissue culture specimens will be available in the near future.